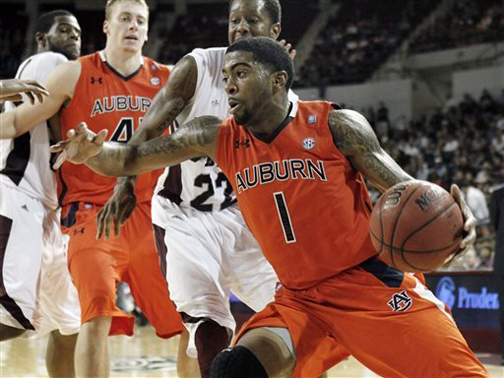 MONTGOMERY, Ala. (AP) -- Former Auburn point guard Varez Ward has been arrested for allegedly trying to fix games and offering money to teammates to help during the 2011-12 season. U.S. Attorney George Beck Jr. said that Ward was arrested Monday on counts of bribery relating to a sports contest and conspiracy for allegedly trying to fix the point spread for the Tigers’ game against Arkansas on Jan. 25, 2012. A federal grand jury indictment last week of Ward was unsealed Tuesday. The one-page document did not list alleged co-conspirators but said the scheme continued after that game. Beck said Ward offered to pay teammates to participate in the point-shaving scheme, which was investigated by the FBI and U.S. Marshals Service. No attorney for Ward was included in the filing, and the number at the address listed for the player was disconnected. Clark Morris, a spokeswoman for the U.S. attorney’s office, said Ward was released Tuesday on $2,500 unsecured bond and had his arraignment set for Thursday in Montgomery. Ward came off the bench in the 56-53 loss to Arkansas but crumpled to the floor after playing only 19 seconds with an apparent leg injury. Ward could face up to five years in prison if convicted and be fined as much as $250,000. Ward was suspended before a Feb. 25, 2012 game, also against Arkansas, and didn’t play for the Tigers again. He was averaging 9.0 points a game and leading the Tigers in assists. In a 68-50 loss to Alabama on Feb. 7, Ward scored three points and had six turnovers while playing 17 minutes. Vegas Insider said Alabama was favored by five points. Ward was hot in a three-game stretch in between when he scored 53 points, including 24 against Mississippi State.